Recent studies of aerial photographs suggest that Prince Edward Island’s first energy crisis was not the 1973 oil embargo but a firewood shortage that predated OPEC by a century. Two posts onThe Otter discuss some of the ways air photos can be used to understand landscape change in the PEI National Park, and a new exhibit stresses the importance of seeing these images as snapshots of time as well as place. Air photos can also be used in a Geographic Information System (GIS) to study land cover and land use change, and the resulting data offer a new tool for understanding the difficult balance between clearing forests for agriculture and leaving enough for fencing, forage, and fuel. Tourists who approach Prince Edward Island on the ferry in 2012 disembark at “Wood Islands” and take in a coastal landscape of relatively unbroken forest, but the ferry’s first passage in the late 1930s would have revealed a very different and almost completely denuded coastline. (Early tourist invitations to “come play on our island” might have included a suggestion to “bring your own firewood.”) The 20th century forest regeneration at Wood Islands echoes a well known story of outmigration and agricultural downsizing in the Atlantic region, evident in sources like the Census of Agriculture. Historians assume that farm abandonment occurred primarily on marginal lands, as families adapted to poor soils and a poorer economy, but air photos offer a detailed portrait and a spatially explicit model of different stresses such as declining access to woodlots and other wildland resources. At the beginning of the 20th century Prince Edward Island’s forests had reached a nadir from extensive agricultural and commercial exploitation of the forest. But only a generation or two earlier, there was an abundance of forest. In 1861, the average Island farmer lived on properties which were only about 38 percent “arable,” or cleared to the extent they could be cropped. Taking into consideration the other thirty percent of the colony not in farms, we see that only about a quarter of the Island had actually been deforested. Forest historians argue that by the end of the century over 70 percent of the Province was cleared for agriculture and the forest that remained had been harvested several times for the shipbuilding industry and domestic use. In a recent Otter post I described how Prince Edward Island farmers responded to a critical food shortage, when the Province’s ruminant population outpaced its marsh and upland hay production. Farmers took to the ice and spent a large part of the winter dredging “mussel mud” to enrich their fields and expand the production of hay and cereals. However, this practice was prevalent in areas where farmers had already cleared most of their land, both because growth required either new land or more productive land and because farms in these areas were running out of firewood. With little forest left, many of these farmers turned their winter activities to hauling mussel mud and began to buy coal or commercial firewood for domestic energy. Using air photos it is possible to identify places where this likely occurred. Figure 1 shows a composite image of four map overlays (labelled A-D on the right) and the location of every home in Lot 30 (labelled on the left), a rural township to the west of Charlottetown. These layers allow me to identify the precise location of homes, the location of the forest, and the places where the density of homes and scarcity of forest would have caused a biomass energy crisis. These data are all derived from PEI’s aerial photographs which were first flown for many Canadian jurisdictions in the 1920s and 1930s. The original air photos were subsequently used to create maps for the National Topographic Series, and in 1990 theProvince of PEI also used them to create historical forest and land use inventories. In the final layer, I used a GIS to measure the amount of forest located within a 2.5 Km radius of each home and made an “energy crisis map” based on the density of points in selected PEI study sites. 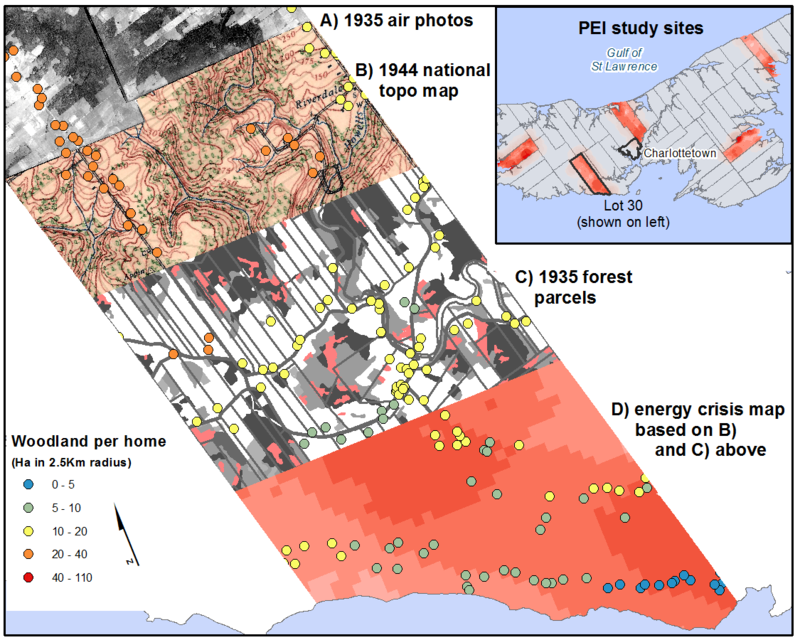 Figure 1: Forest history data derived from air photos, Bonshaw, Lot 30, P.E.I. 1935. Photos and inventory courtesy of PEI Dept of Forestry. This map shows areas where rural and small town resettlement was putting pressure on natural ecosystems. For example, Lot 30 had approximately 14 hectares of forest for every home, but the homes marked with blue dots had direct access to less than 5. Clearly these farmers lived in an interconnected world and had access to fuel from local outfits and importers, but what is important here is that their immediate fuel supplies would not have lasted more than a few years at even a conservative rate of consumption. Additional research and a presentation at the Canadian Historical Association / Canadian Association of Geographers at Congress 2012, in Waterloo, will show what kinds of woodlots remained in the most densely inhabited areas. We might expect that harvesting was most intense in those areas and regenerating plots were not. The forest inventories recorded not only the outline but the cover type of each forest parcel, and GIS lets us query the inventories for these sorts of questions. The 1935 PEI inventory may be the earliest in Canada, and due to the Province’s small size and complete air photo coverage it is certainly the most comprehensive. Behind the inventories, however, are ordinary air photos, and researchers interested in recreating topographic features can find great coverage of local areas at university libraries such asBrock, Dalhousie, Toronto, Waterloo, and Western. For larger areas consult the National Air Photo Library’s enormous collection and online search engine in Ottawa. All air photos contain distortions, and if your research relies on accurate locations, distances, and measurements it is important to correctly “georectify” and digitize these features with the proper projection in a GIS. Many online tutorials are available to help with these processes. If you only require the general description and location of topographic features then you might want to use the closest National Topographic Series (NTS) map for your period of interest. Aerial photographs, NTS maps, and historical forest and land use inventories offer a new way to study the relationship between farms and forests. If the NTS maps were a sort of census of the Canadian environment in certain years, then aerial photos were the original manuscripts behind the printed census. Just as social and economic historians often need to consult the nominal censuses for a new level of detail, historians of the environment can find information in the original air photos (e.g. forest types, land use, coastal erosion, building location/orientation, sub-urban spaces, pollution and brownfields, etc.) that may not have interested the cartographers. D. G. Sobey and W. M. Glen, “A Mapping of the Present and Past Forest-types of Prince Edward Island,” Canadian Field-Naturalist 118 (4) (2004): 504-520. NiCHE Resources for learning and developing Historical Geographic Information System (HGIS) projects.